real estate in the Philippines | Stateland, Inc.
With its 37-year track record in the real estate industry, Stateland, Inc. continues to create unparalleled housing and community projects in key areas of Luzon. It has built more than 30 horizontal developments in Cavite, Laguna and Metro Manila, with each community catering to each family’s needs and wants. Also, with its well-crafted, master-planned community with durable houses that lasts, Stateland, Inc. makes no compromises to the quality products it offers to its clients. As of to date, Stateland, Inc. has seven on-going community projects in the diverse and strategic areas in Southern Luzon, specifically in Cavite and Laguna. These communities , together with the completed ones, provide a warm atmosphere that makes living more enjoyable, worthwhile and convenient. 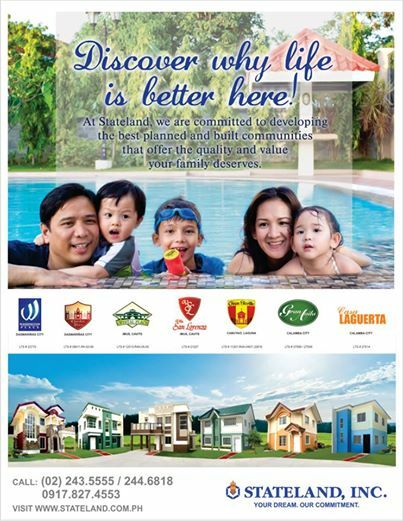 With amenities that suit the lifestyle of every family member, locations that is stone’s throw away from necessities like supermarkets, malls, schools and churches, house designs that matches the style and taste of unique families and affordable prices that are always within reach, Stateland, Inc. promises to provide every Filipino family a house that’s worthy of their hard-earned money and that will ensure their safety, convenience and satisfaction. With its aim for constant growth and diversification in varied levels of real estate projects catering to the high, middle and low-income markets, that company ensures that it offers above the cut products that are always hinged on quality and gives optimum value to its stakeholders. Different projects of Stateland, Inc.